Creed is, or at least it used to be, one of the most prestigious perfume companies in the whole world. It is actually the world's only dynastic, privately held luxury fragrance company; founded in 1760 and passed from father to son since then. 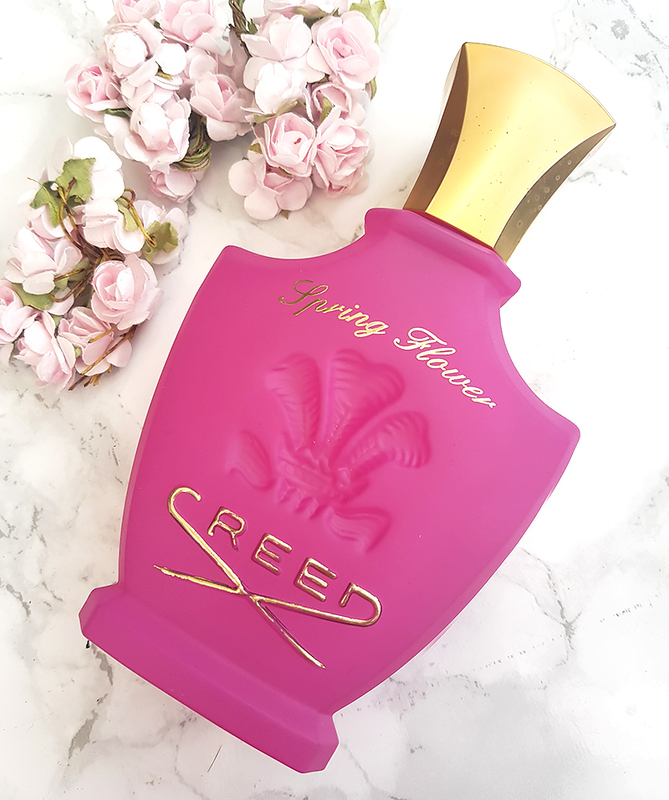 Creed are especially known for serving royal houses throughout history - they have created personal fragrances for people like King George III, Winston Churchill, Napoleon III, John F. Kennedy; as well as celebrity icons like Grace Kelly (they actually designed her wedding day scent!). In the recent decades, Creed decided to make their perfumes accessible to the general public and these are now widely available in many stores and online. It's a little ironic though, if you ask me - to go from the private halls of royalties all around the world, to a discount shelf in TK Maxx! Spring Flower was originally designed for Audrey Hepburn, and it is also Lana Del Rey's signature scent. Creed describe it as 'enchanting, spirited and joyous', and it's supposed to contain only natural ingredients harvested from all around the world. To be honest, I don't think that this really looks like a £200 perfume. The bottle is pretty, but the block pink colour definitely takes away from the sense of luxury and elegance that you'd expect. 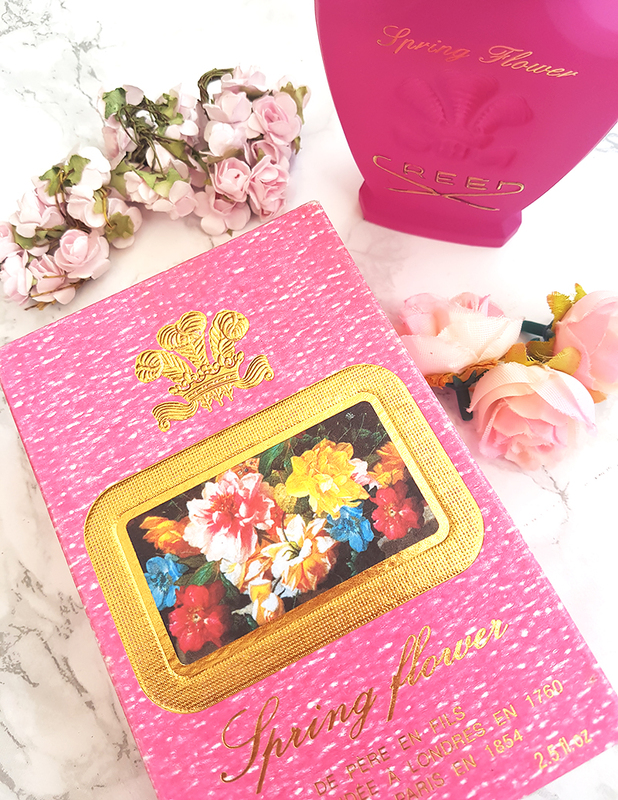 The box itself looks very vintage, but I also found it to be a little cheap and flimsy - if you hold it up with the perfume inside, the bottle is likely to fall through the bottom! Not at all like a £200 perfume, to be honest! It is a pretty fragrance - very fruity, pleasant and delicate. However, it definitely does not carry that sense of royal luxury and exclusiveness that you would likely expect from it. Spring Flower smells youthful and uplifting, but it's also very simple and casual. It makes me think of a big fruit basket full of fresh peaches, apricots, pears and melons. Right after spraying it, you can mainly smell the citrusy accords, but the scent mellows out with time; bringing forward more floral nuances of rose and jasmine. It is very airy and light, almost aquatic; and it smells just like a fruity mist. If I was to try it blind-folded, I would have probably guessed it to be a mid-range summer scent, along the lines of Versace's Bright Crystal or Escada's Joyful.